We posted stage winner Pascal Ackermann's Team Bora-hansgrohe report with the results. Primoz Roglic has won the overall classification in the Tour de Romandie. In the final stage to Geneva the first position of the team captain of Team LottoNL-Jumbo was never at risk. For the 28-year-old Slovenian it is his fourth win of the season, and his second overall win in a WorldTour stage race. Earlier this month, Roglic won the Vuelta al Pais Vasco. The overall win of Roglic meant the eleventh win for Team LottoNL-Jumbo this year. Roglic laid the foundation for his final victory in the two time trials and was able to keep himself upfront in the remaining stages with the help of his Team LottoNL-Jumbo teammates, who controlled the race diligently. With Steven Kruijswijk, the team of manager Richard Plugge has a second rider in the top ten of the overall standings. He finished in sixth place. Merijn Zeeman, sport director at Team LottoNL-Jumbo, called the development of Primoz unprecedented. “He’s with the team now for the third year. His development as a cyclist, as a former ski-jumper, is phenomenal. It’s a dream for us to see how he develops. As a person, as a cyclist and as a leader of this team. He’s a fantastic person to work with. He has now won two of the most prestigious WorldTour stage races on the calendar with the Vuelta al Pais Vasco and Romandie. The way Kruijswijk as fellow team leader has put his own ambitions aside for Primoz, is nice to see. This also indicates how good the atmosphere is within the team. 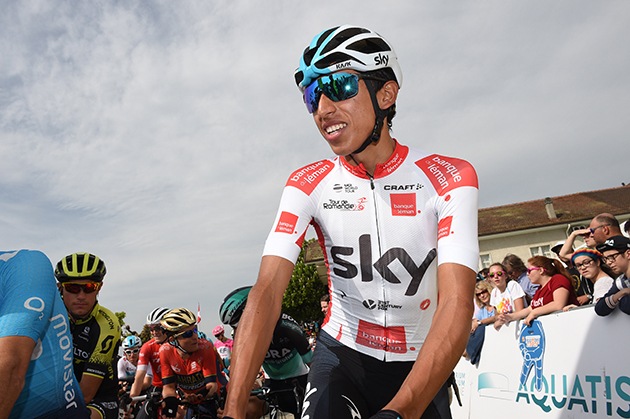 Egan Bernal wrapped up second overall and the young rider’s jersey on the final day at the Tour de Romandie to cap another impressive week for the 21 year old. The fifth and final stage came down to a bunch sprint in Geneva and Pascal Ackermann (Bora-Hansgrohe) took the win, with Bernal safely rolling over the line to secure his first overall WorldTour podium. 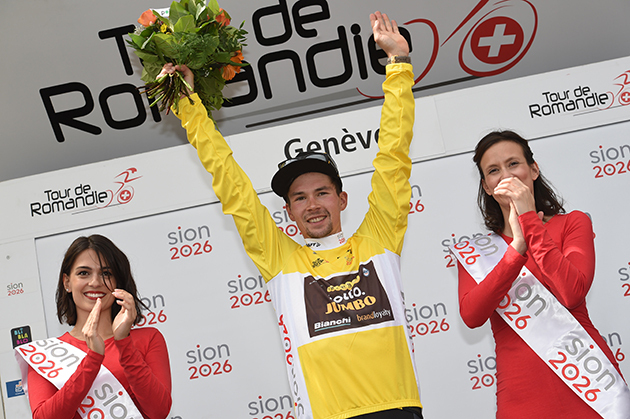 Primoz Roglic (LottoNL-Jumbo) retained his eight-second lead over the Colombian to take the title in Switzerland. Pavel Sivakov had impressed earlier in the day by making the break, but the peloton worked hard to keep the five out front within touching distance, and the group was swept up with 10 kilometres to race. Then it was a case of keeping Bernal out of trouble. Geraint Thomas and Luke Rowe came to the fore, keeping the 21 year old at the front of proceedings, and he was able to finish in a comfortable 17th, before making his way to the podium. Sport Director Dario Cioni has overseen Bernal’s impressive performance this week and was full of praise for the Colombian. Egan Bernal at the start of stage five. He said: “Egan was probably the strongest rider in the race on the climbs, but he came up against a very strong opponent in Roglic, who did better than him in the prologue and managed to hang on to those few seconds. Cioni believes Sivakov also has a big future ahead of him, after the 20 year old impressed in the break. “We knew it would probably be a sprint,” he continued, “but we thought if the break got away with enough men out front, there was a chance it would make it to the finish. Unluckily for Pavel the break was only five guys, but the peloton had to work really, really hard to pull them back. 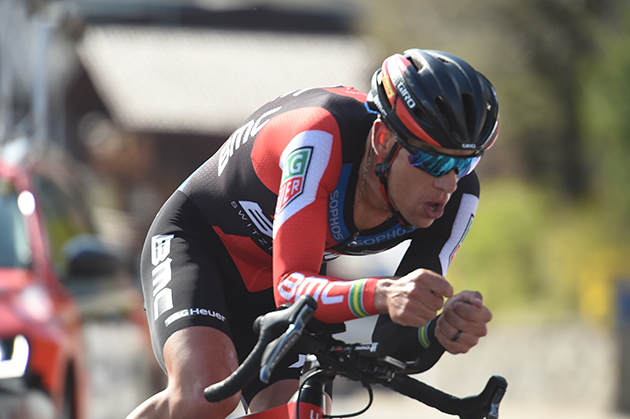 29 April, 2018, Genève (SUI): Richie Porte secured third overall at the Tour de Romandie today after crossing the line safely in the bunch sprint on the final stage, which also saw Rohan Dennis finish inside the top ten on the General Classification. Richie Porte riding the stage three time-trial. Despite ending in a sprint showdown on the streets of Genève, stage 5 was littered with short climbs, including three category three ascents in the first half of the 181.8km course. As has been the case throughout the week, the battle to form the breakaway started early with five riders eventually going clear and extending an advantage of 2'45" after almost 20km of racing. However, the peloton kept the race under control, never allowing the leaders to go more than 3'30" up the road and ultimately setting the stage for a fast and furious finish. The gap was hovering around the two-minute mark as the chase began to heat up with the sprinters' teams coming up to the front of the bunch to help race leader, Primoz Roglic's Team LottoNL-Jumbo teammates with the pacemaking inside 70km to go. The gap fell to under one minute approaching the 30km to go mark with the peloton strung out along the road as the catch was eventually made 20km later. It was an intense run into the line with a late attacker caught inside 5km to go as the speed of the bunch saw riders beginning to lose contact approaching the flamme rouge. After being protected by his BMC Racing Team teammates all day, Porte was well-positioned in the first half of the peloton in the closing kilometers of the day before crossing the line safely in the main bunch, behind stage winner Pascal Ackermann (BORA-Hansgrohe), to secure his spot on the podium, 35 seconds behind Roglic. Dennis also crossed the line safely and after a solid week of racing in Switzerland, he finished seventh on the General Classification, 2'49" back. "When you come into a race as defending champion, it is always nice to be good but obviously with Andy Rihs passing away last week, and with this race being one of his favorite races in his home country, I would have loved to have won again. However, that didn't really fit with where I was coming from and my main goal is in July. It hasn't been the most straightforward run in so far, so to be there or thereabouts at this race is a good sign I think." "I am coming out of this race with a lot of confidence. Yesterday I felt like I was struggling a little, and then there was only one point on stage one where I didn't feel great, but for the rest of the race, I was pretty comfortable. Looking at that, and considering the pace we have been racing at, it is a good sign. I think this year, I have taken another step forward in terms of my ability to suffer on the climbs and I think compared to last year I am in an even better place. I now need to recover from this week, it's been a hard race, but I am excited about heading to the Giro d'Italia." "This is a good result for us. It was what we were hoping for and today was all about making sure we finished in the front and without any problems. The team worked well again today and they rode well around Richie Porte and also Rohan Dennis in the final. In the end, Tom Bohli and Danilo Wyss tried to do something in the sprint but it was chaotic. We knew it would be difficult as we weren't the favorites for the sprint but we wanted to try something and it was good for two Swiss guys to do that." "Rohan Dennis now heads to the Giro d'Italia and he has proved here that he is in a great condition to really try for the GC and work towards both his own goals and the goals of the team. For Richie, it's now back to work ahead of the Tour de Suisse and of course, the Tour de France but I think we can come out of this race confident. He is coming out of this race at a good level and we are looking forward to the months leading up to the start of the Tour." The Tour de Romandie finished with a group sprint in Geneva, where Roberto Ferrari raced to a good third place. Rui Costa, Daniel Martin and Kristijan Durasek closed the final overall in fifth, 10th and 15th, respectively. 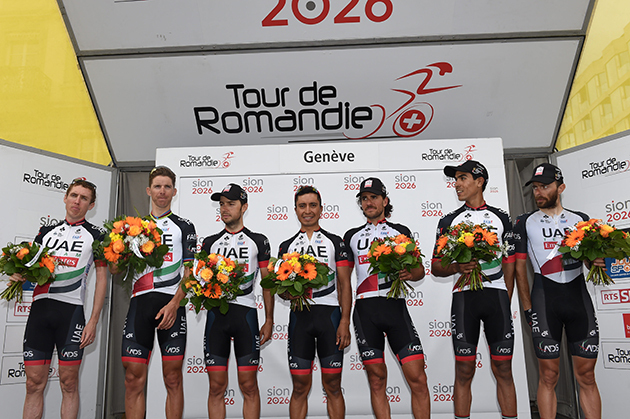 The good group performance reflects in UAE Team Emirates’s victory in the team classification. UAE-Team Emirates at the final awards ceremony. UAE Team Emirates leader Daniel Martin agreed. “I came here in good condition even if I was a little tired after the classics,” Martin said. “It was a good week in view of my season goal, the Tour de France. As a team, we’re happy with the overall classification, that we were able to also get on the podium as the best team in this edition of the Tour de Romandie. German Pascal Ackermann (Bora) won the final stage today in a sprint. Slovenian Primoz Roglic (LottoNL-Jumbo) took home the overall winner’s trophy.